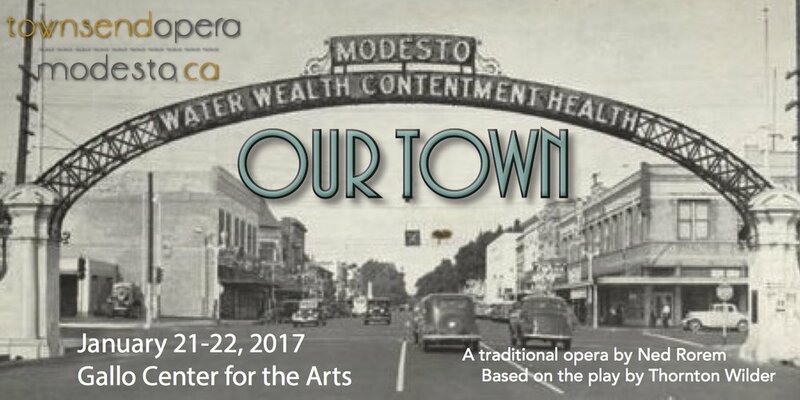 Fresno Grand Opera is excited to announce the company will host a community event around its production of the opera Our Town that celebrates the history of Fresno. The event – Celebrate Our Town – will feature a narrative and photographic historical perspective of Fresno, displays and oral presentations by community and business leaders, personal accounts of the development of the community and interesting anecdotes from longtime Fresno families. Embracing the long tradition of storytelling in opera, Celebrate Our Town will tell the story of Fresno, providing residents of our community a unique opportunity to explore the place they live, deepen their understanding of our community, and spur interest in civic engagement. Organized in partnership with the Pop Laval Foundation, Hedrick’s Chevrolet and several other community organizations, the exhibit will take place in the lobby of the Veterans Memorial Auditorium Saturday, January 28 and Sunday, January 29, to coincide with the company’s performance of the Ned Rorem’s opera Our Town, based on the Thornton Wilder play. There will be numerous opportunities for community residents, leaders and businesses to actively participate in telling the story of Fresno, including community web forums, storytelling contests and community photography displays. Fresno Grand Opera continues to welcome potential community partners for this event. Interested parties should contact General Director Matthew Buckman at 559.442.5699 or mbuckman@fresnograndopera.org. This community event is the beginning of a multi-year initiative by Fresno Grand Opera to tell the stories of our community and our region through presentations of main stage operas. Future projects include an exhibit about migrant workers during the performance of the opera Of Mice and Men and community events exploring the role of agriculture in the growth of our community during the performance of the opera The Grapes of Wrath.